Pro Pooling is the go-to solution for simple yet powerful pooling and spawning in Unity. 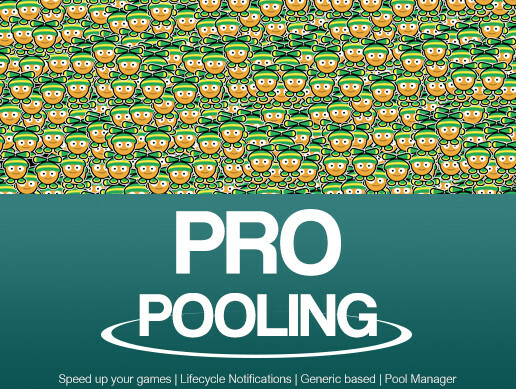 Designed from the ground up to increase game performance and save development time, Pro Pooling provides a comprehensive yet easy to use system for pooling including configurable pools, and powerful object spawning and despawning. As the number of items in your game increases, performance can take a serious hit, especially when these items are dynamically created and destroyed such as enemies, projectiles, bullets, collectables or other items. Pooling is the concept of pre-allocating and reusing items and is essential for fast game performance to avoid high overheads caused by continuously creating, initialising and destroying gameobjects. Pooling is an essential part of any game that allows for faster and smoother performance and when when implemented with Pro Pooling can help drastically increase your productivity. * Speed up your games and save memory with fast prefab pooling. * Create pools through the Unity Editor, with code or automatically. * Advanced automatic spawning of items. * Full pool lifecycle notifications to manage your pooled items. * Generic based pool items to help you manage per pooled item configuration, settings and data making things even faster. * Pool event components to help work with pooled items and automate despawning. * Integrated and works with Game Framework (free and extras bundle). * Designed for all platforms, optimised for mobile. Pro Pooling is now also included in the extras bundle version of Game Framework as the preferred way of pooling. You may want to consider downloading that asset to save. We value your feedback and are always looking to improve our products. Contact us if you need help getting up and running, or have any questions, suggestions or feedback.